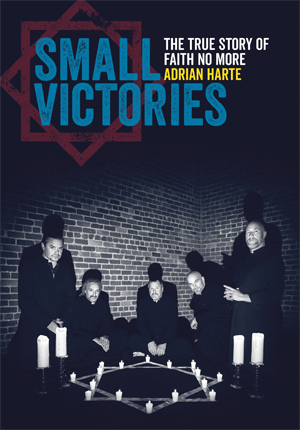 Adrian Harte, the blogger whose website, Faith No More 2.0 (www.newfaithnomore.com), has become the pre-eminent source for all things FAITH NO MORE, releases the book, Small Victories: The True Story of Faith No More on Sept. 12 via Jawbone Press. Small Victories… tells how such a heterogeneous group formed, flourished, and fractured, and how FAITH NO MORE helped redefine rock, metal and alternative music. The book chronicles the creative and personal tensions that defined and fueled the band, forensically examines the band’s beginnings in San Francisco’s post-punk wasteland, and charts the group’s ascent to MTV-era stardom. Based on meticulous research and hundreds of interviews, the book combines a fan’s passion with a reporter’s perspicacity.